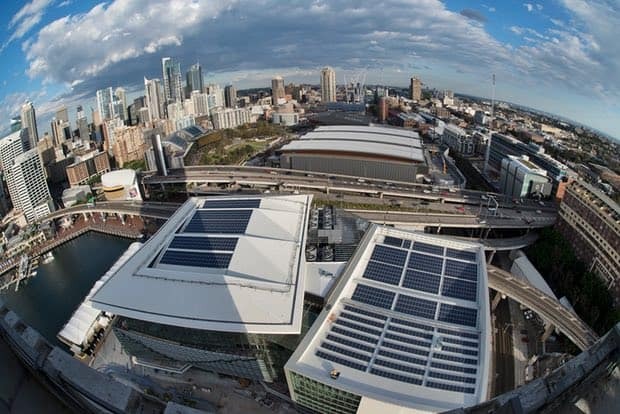 Sydney Renewable Power Company, chaired by fashionista Carla Zampatti’s daughter Allegra Spender and Andy Cavanagh-Downs, have raised $1.43m in funds from the public to fund a 520kw PV solar array on the roof of the brand new Darling Harbour International Convention Centre. Shares were offered at $2,750 each and reached the target amount easily, with even the interested Zampatti missing out as Spender advised that ‘family goes last in that situation’. When the construction of this rooftop solar array was approved in 2013, it represented the largest rooftop solar installation in Australia. The ICC project has since been overtaken (by over 200%) by the efforts of GPT in Darwin, where the Casuarina Square PV array boasts a 1.25MW (megawatt), 2030MWh p.a. (megawatt hours) size, enough to power 310 households. Stockland in Shellharbour (1.2MW in Illawarra with 3991 PV panels, generating 4,789kWh per day) and Weatherill heights (925kW with 2,900 PV panels, generating 3,620 kWh per day) also have larger rooftop solar installations. It’ll be great to see what Stockland come up with next as they have shown themselves as being a market leader in creating environmentally friendly developments with a strong emphasis on solar. CEO of Commercial Property at Stockland, John Scroder, was quoted to InsideRetail as saying “Our investment in sustainability initiatives like solar not only provide a number of environmental benefits but also new jobs and financial savings for our retailers.”. Geelong Solar – Council to install solar at pools. ← Microgrid in NYC using blockchain technology launched.